Above is a layout of the desired network. I am struggling with getting it just right. The internal link from the router is not relevant for this problem. The only container directly exposed to the public, should be the proxy. All containers can communicate with eachother, preferrably via host name (see user-defined docker network). Some services such as Portainer require internet access (outgoing) to retrieve some data from their servers but should otherwise not be directly accessible. 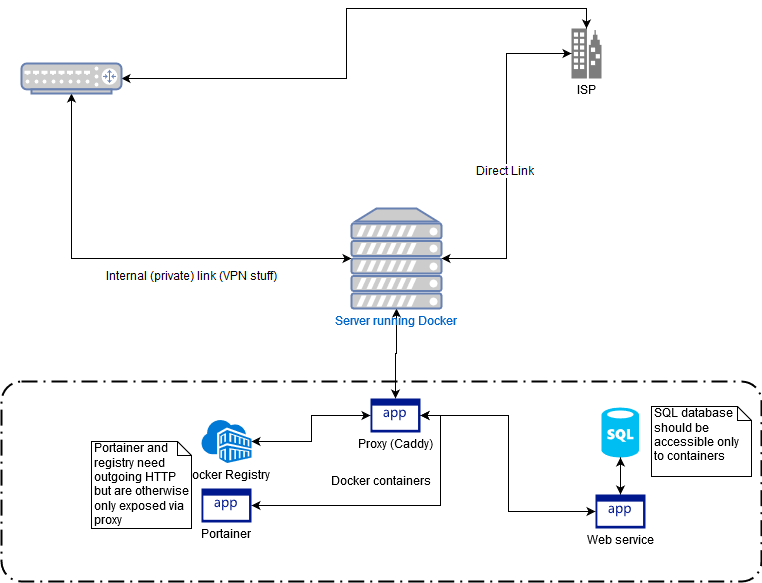 The host may be allowed to access container services directly, but only from the host itself, not externally. The proxy correctly proxies the desired containers to the outside. All containers can communicate with eachother and their IP can be resolved via service name. If they are not in a bridge network they don't have internet, but if they are, they are accessible directly. I am configuring everything via Portainer, and the docker host is using Firewalld. Thanks in advance for any suggestions! Fail2Ban with Kubernetes? or any other alternative?